Photo by Todd Breitenfeldt, WHS science teacher. Common names: wild mourning glory, creeping Jenny, and European bindweed. 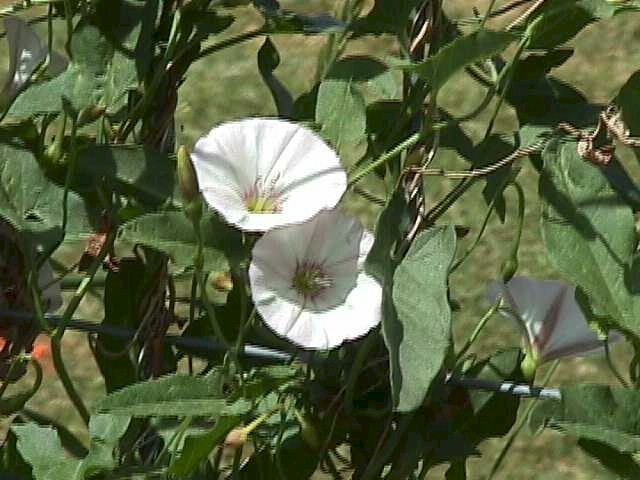 Seeds: The seeds of field bindweed stay viable in the soil for up to 40 years. (1) They reproduce by seeds and rhizomes. The seed pods of field bindweed are pointed and five mm long. The plant also has four rough pear shaped seeds that grow in each pod. Chemical Control: You can chemically control field bindweed by using herbicides, 2,4-D, glyphosate, and dicamba. You should use several applications at the beginning of June. 1. Henry, Charlie, Colorado Weed Management Association. [online] available. www.fortnet.org/cwma/bindweed.htm, November 2, 1998. 2. James, Jeff, Field Bindweed. [online] available www.members.aol.com/prideedu/bindweed.htm, November 5, 1998. 3. British Columbia Ministary of Agriculture and Food, [online] available www.agf.gov.bc.ca/croplive/weedguid/bindweed.htm, October 4, 1999. 4. Field bindweed, [onlive] available Www.arc.ab.ca/crop/weed/bindweedAgent.htm, April 16, 1997. 5. Nova Scotia Noxious Weeds, [online] available. agri.gov.ns.ca/pt/ipm/weeds/pibw9614.htm, May 26, 1997. 6. Brietenfeldt, Todd, Personal interview, Biology teacher, Whitehall High School, P.O. Box 1109, Whitehall Montana, 59759, September 9, 1999.